The Accelerated Osteogenic OrthodonticsTM (AOO™) procedure significantly decreases orthodontic treatment times by completing the orthodontic process 3 to 4 times faster than conventional orthodontics. By fusing together orthodontic mechanics with periodontal techniques, patients can enjoy minimal time in braces and lifelong results. The treatment is ideal for adolescents and adults who have their permanent teeth present, but do not want to experience lengthy, traditional orthodontics. For many, social and professional responsibilities, like middle and high school for adolescents, and career obligations for adults, are reasons enough to decline orthodontics, even if they could greatly benefit from the results. Over the last several decades, conventional orthodontics have improved from advancement of arch wires, to bands, brackets, cements and now clear tray aligners, such as Invisalign™. Despite this progression, traditional orthodontics can still take years of treatment before finally complete. 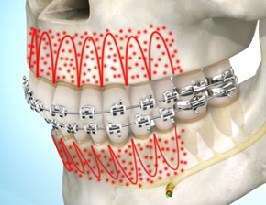 The AOO™ procedure works by transferring the emphasis of the orthodontics in regards to tooth movement specifically from the way traditional forces are applied to the teeth through wires, arches and bonding materials, to an emphasis on the bone physiology, and the way the supporting bone responds to orthodontic forces. The procedure involves treatment of the alveolar bone, the thickened ridge that holds teeth in place, hard tissue grafting and in some cases, soft tissue grafting, which work together to manipulate the bone to allow faster teeth movement. Ultimately this decreases the need for lengthy, conventional orthodontics. If you would like to improve your smile without the lengthy and difficult process of conventional orthodontics, you may be a candidate for Accelerated Osteogenic OrthodonticsTM. The board certified periodontal experts at The Center for Advanced Periodontal & Implant Therapy offer surgically accelerated orthodontics to help patients smile confidently again!